If you have to travel between Lowestoft and Great Yarmouth stations by train, you have to change at Reedham station. Or you should be able to! These pictures show the station. You can’t do the direct journey between East Anglia’s two largest Eastern towns at present, as Network Rail have got their special Project Management knickers on. You know the ones with a twist! So passengers between Lowestoft and Great Yarmouth have three options. Take an hour and a half jurney via Norwich. Take a bus, which probably visits half of the villages in the local area. Hopefully, the Reedham to Great Yarmouth service will be restored sometime in the near (?) future. This will allow two ways to travel by rail between Lowestoft and Great Yarmouth. Theoretically, this should work, especially, if trains were timetabled so that passengers waited perhaps a couple of minutes on what I suspect in winter can be a very pleasant station. Look at the footbridge. Do Greater Anglia really expect elderly travellers or those with bikes, buggies and baggage to use the Victorian footbridge? I suspect Greater Anglia don’t see this as a feasible way of attracting more passengers out of their cars and from the buses. But Network Rail haven’t got the millions of pounds needed to bring the station into the Twentieth Century! It would be possible for a train to shuttle between Lowestoft and Great Yarmouth, which could reverse in Reedham station. In Norfolk Rail Line To Remain Closed As £68m Upgrade Project Overruns, I asked if the new Class 755 trains had a fast reverse procedure, as Greater Anglia’s services are full of stations, where a train must arrive and leave a few minutes later. A simple system could be as follows. On arrival in a station, the driver would put the train into a standby mode, when it was safely stopped. The driver would then walk through the train to the second cab. Whilst the driver is changing ends, the conductor is opening and closing the train doors and supervising the loading and unloading of passengers. On arrival in the second cab, the driver would wake up the train and check everything. After the doors are closed and having received the all clear from the conductor and a green light from the signals, the driver would proceed. At all times, the driver and conductor, would have emergency remote controls to immobilise the train, if something is not what it should be. Modern automation is certainly able to design a very safe system, that would save time at every reverse. The stop ar Reedham station would become an almost normal stop and I would expect that a train could reverse in about two or three minutes. Could this be the most affordable solution? The track layout at Reedham station would be modified, so that all trains would use the Norwich-bound Platform 1. Platform 1 is improved with a quality waiting room and a coffee kiosk, to make a short wait between trains more pleasant. If there were two trains per hour on both the Lowestoft and Great Yarmouth routes, I’m sure that with the new signalling and good driving, a single-platform at Reedham station would work. Trains from Norwich could call at XX00, XX15, XX30 and XX45, with trains to Norwich calling at XX07, XX22, XX37 and XX52. If trains stopped in the right order, then there would be a maximum wait of eight minutes in a comfortable waiting room at Reedham station. Even with only one train per hour between Norwich and Yarmouth via Reedham, I’m certain an acceptable timetable could be devised. Greater Anglia have ordered thirty-eight Class 755 trains, which have a total of 138 cars. These will replace twenty-six assorted trains, which have a total of 55 cars. This is a increase of 46% in the number of trains and 150% in the number of cars. Greater Anglia didn’t increase the fleet so that could sit in sidings, so I think we can expect some new services and higher frequencies. I’m certain that a sensible hourly service between Lowestoft and Great Yarmouth stations can be devised. A major railway upgrade project has been delayed, meaning a Norfolk branch line will go longer without a service. Network Rail is spending £68m to replace Victorian signalling equipment with a computer-based system between Norwich, Great Yarmouth and Lowestoft . The project was due to be complete by 31 March, but the deadline will now be pushed back to allow for more testing. As only Berney Arms station will be without a service, this probably isn’t a major disaster for the thousand passengers, who use the station in a year, but the story does have a very familiar ring. Either they’ve found a very serious problem or the planning wasn’t the best! There used to be a direct Yarmouth to Lowestoft Line, but now it is possible to use the Wherry Lines, with a reverse at Reedham station. 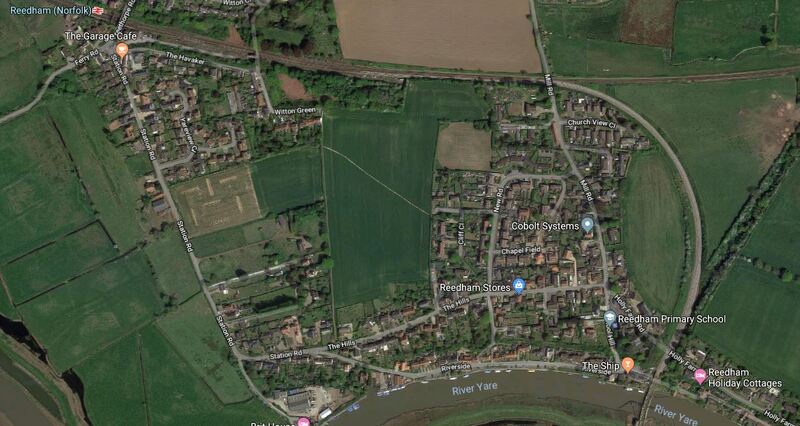 Network Rail are talking about reinstating the Reedham Chord to create a more direct route between East Anglia’s largest North-Eastern towns. This is said about the Reedham Chord in Direct Yarmouth Services in the Wikipedia entry for Lowestoft station. In January 2015, a Network Rail study proposed the reintroduction of direct services between Lowestoft and Yarmouth by reinstating a spur at Reedham. Services could once again travel between two East Coast towns, with an estimated journey time of 33 minutes, via a reconstructed 34-chain (680 m) north-to-south arm of the former triangular junction at Reedham, which had been removed in c. 1880. The plans also involve relocating Reedham station nearer the junction, an idea which attracted criticism. This is a Google Map of the Reedham area. Reedham station is in the North-West corner of the map. The single-track line to Yarmouth and the double-track line to Lowestoft, run together to form a triple-track railway to the East of Reedham station. There are a large number of cross-overs in the triple-track section to the East of Reedham station, so that trains can easily go between either platform at Reedham and Yarmouth or Lowestoft. The line to Yarmouth goes straight away to the East. The line to Lowestoft curves South to cross the River Yare. The Reedham to Lowestoft tracks appear to have been relaid, as far as the bridge. Will the new track layout and signalling, allow trains between Lowestoft and Yarmouth to perform a fast reverse in either platform at Reedham station? This approach has advantages over the reinstallation of the Reedham Chord. Reedham station won’t need to be relocated. All trains between Lowestoft and Yarmouth will stop at Reedham station. There would be no need to build the Reedham Chord. I also suspect, that not building the Reedham Chord is the more affordable option. Do Class 755 Trains Have a Fast Reverse Procedure? Greater Anglia have a number of routes, that will be run by new Class 755 trains, where the trains will need to be reversed at either end. When Stadler designed the Class 755 trains for Greater Anglia, did they propose simple automation, so that trains could be reversed in the minimum time at these numerous terminals? What I have described here, is much less ambitious than the system I described in Crossrail Trains Will Have Auto-Reverse. This auto-reverse system will be used at Paddington on Crossrail, by the Class 345 trains, to allow the driver to change ends on a two-hundred metre long train, whilst it is reversing to return to the East. Obviously, adequate testing must be done with all trains that will use the new signalling on the Wherry Lines between Norwich, Lowestoft and Yarmouth. This article on the BBC is entitled ScotRail Class 385 Fishbowl Windscreen Safety Concern. Aslef has warned that modifications must be made to ScotRail’s new Class 385 electric trains – or its drivers will refuse to work them. The train drivers’ union is concerned that the curved windscreen is causing reflections of other signals at night. Drivers identified the problem on a recent evening test run between Glasgow Central and Paisley Gilmour Street. Testing of the ~Norfolk signalling will cover a myriad of possible problems, against the whole route and all possible trains. But there is one problem, that is probably delaying the project. The Class 755 trains have not been certified yet! So starting of the testing can’t be started. This delay is more complicated, than initial reports suggest. On the other hand, I wouldn’t be surprised if Network Rail have produced a track and signalling solution, that will allow a direct service between Lowestoft and Yarmouth, with a reverse at Reedham. Typical timings appear to be. Given that the Class 755 trains have the following characteristics. They are 100 mph trains. They are optimised for fast stops. I wouldn’t be surprised to see a sub-forty minute time between Lowestoft and Yarmouth. Using the current times between Ipswich and Lowestoft and Norwich and Yarmouth, it also looks like a sub-three hour scenic route is possible between Ipswich and Norwich. Where Will Greater Anglia Deploy The First Class 745 Trains? This article on Railway Gazette is entitled ‘Gorgeous Beast’ Will Change Perception Of Rail Travel. This is unusual language, when you’re talking about modern diesel and electric trains, especially when it comes from the CEO of a financial company investing in trains, as a safe long-term investment for money like pension funds. But if the Class 755 trains cause Mark Swindell to use such language, they must have something about them. Perhaps, it’s the fact that they follow the layout of the legendary and much-loved by some, Class 442 train, which also had a power-car in the middle. It is informative to compare the Class 442 train with a four-car Class 755/4 train. The 442’s power-car is electric, whilst the 755/4’s is diesel/electric and can be diesel/electric/battery. The 442 has seats for 346 in two classes, whilst the 755/4 has 229 in a single class. Both are 100 mph trains, although the 442 holds the World Record for a third-rail train at 108 mph. I am drawn to the following conclusions about the Class 755 train. Passengers will have plenty of space, in addition to the customer comforts, which appear to be of a high standard. Some passengers might miss First Class, but will the extra space compensate. The power figures quoted in the Railway Gazette show the following. In electric mode, the train will have more than double of the power of the 442. In diesel-electric mode, the train has sixty percent more power, than the 442. This will mean that the train should have superb acceleration. With all this power, the planned operating speed of 100 mph will be determined more by the track, signalling and other trains, rather than any limitations of the trains. There are three improvements in Network Rail’s Improvement Pipeline, that will allow faster running by Class 755 trains. The improvement will help these services by Class 755 trains. Norwich to Stansted Airport via Ely, Cambridge North and Cambridge. I could also see the operating speed on the Breckland Line raised. How will the routes be affected by trains with a better performance? Currently, the two legs take. Which adds up to a convenient 2:03. With the faster trains and eight stops, it looks like this route could be done several minutes under two hours, with a round trip of four hours, which would need four trains for a one train per hour (tph)service. Currently, this route takes 1:16 with eight stops. This is not very convenient and the time savings needed to get the route under an hour will not be easy. Which adds up to a convenient 2:00. With the faster trains, it looks like this route could be done several minutes under two hours, with a round trip of four hours, which would need four trains for a one tph service. Currently, this route takes 1:26 with nine stops. With the faster trains, it looks like this route could be done several minutes under one-and-a-half hours, with a round trip of three hours, which would need three trains for a one tph service. It also looks like up to three trains per day will run from London to Lowestoft. So Which Route Will Get The New Trains First? Greater Anglia will obviously deploy them, where there is the greatest need for extra capacity or there is the greatest return to be made! I think, we’ll see them on the Lowestoft route or between Cambride and Norwich first. They’ll certainly be worth waiting for, if Mark Swindell is right. Is Platform 1 At Ipswich Station Big Enough? For some years, trains for Felixstowe and Lowestoft have usually shared Platform 1 at Ipswich station. But with the new longer Class 755 trains replacing the current Class 150 or Class 153 trains, I suspect this will no longer be possible. I was going to Felixstowe and my train left and returned to Platform 2B, which in the fourth picture is occupied by the back end of Norwich to London Express. It looks like when all the new trains are in service, Platform 2 will be used by the following trains. Three trains per hour (tph) from Norwich to London. In addition four Lowestoft services per day will go to and from London. It strikes me, trains will have to keep very much to time or there is a need for an extra platform. 05:17 – 07:25 – 2 hr. 8 min. 06:17 – 08:25 – 2 hr. 8 min. This is matched by three trains a day between Liverpool Street and King’s Lynn, in the Evening Peak. 17:07 – 19:08 – 2 hr. 1 min. 18:-07 – 20:10 – 2 hr. 3 min. 19:07 – 21:05 – 1 hr 58 min. The two Morning Peak trains stop at Watlington, Downham Market, Littleport, Ely, Cambridge North, Cambridge, Whittesford Parkway, Audley End, Bishops Stortford and Tottenham Hale. The three Evening Peak trains call similarly, but miss out Cambridge North. Services are run by Class 317 or Class 379 trains. All the passenger trains on the Fen Line including Great Northern’s Class 387 trains, are four x twenty metre cars, which can run as four, eight or twelve cars. This article in the Eastern Daily Press is entitled Plans For Longer Trains Between King’s Lynn And London Could Be Delayed. Reading it, I get the following impressions. The Fen Line can currently accept four-car trains. Plans have been or are being developed to lengthen all platforms to accept eight car trains. Extending further might well be out of the question, on grounds of cost and inconvenience to passengers, whilst the work is carried out. There is a problem for Greater Anglia, as both the Class 317 and Class 379 trains are being moved on. The thirty x four-car Class 379 trains, that work the express West Anglia Main Line services are being replaced with ten x twelve-car Stadler Class 745 trains. These trains will be too long for the Fen Line. Five-car Class 720 trains would fit the Fen line and as they are 100 mph trains, like the Class 317 and Class 379 trains, they could handle the current service. Greater Anglia currently have the equivalent of twenty-eight assorted diesel trains in different lengths, which they are replacing with thirty-eight bi-mode Class 755 trains. Bi-mode trains with the ability to run on electric or diesel. Compatible with the Class 745 trains. Fourteen will be three-car trains and twenty-four will be four-car trains. Greater Anglia, have already said they will run services to and from Liverpool Street from Lowestoft, so will they use the extra trains to run services to and from Liverpool Street to important East Anglian towns? It is worth looking at the capacity of the various trains. Would a four-car Class 755 train have sufficient capacity for a service between Kings Lynn and Liverpool Street? I think the answer is probably in the affirmative, but a six or seven car train couple be created, by joining two trains together, if required. So if the Class 755 trains can provide direct Liverpool Street services for Kings Lynn and Lowestoft, what other towns could get a direct service to London? Yarmouth via Via Norwich and either Ipswich or Cambridge. I can remember, when some of these towns had services to Liverpool Street. Trains could also split and join at Cambridge and Ipswich to save paths on the main lines to London. Could trains go up to London in the Morning Peak and return in the Evening Peak? If there was sufficient demand, they could return in mid-morning and come back to Liverpool Street in mid-afternoon, in time for the Evening Peak. If so, how many trains would be needed? Considering, that my rough calculation, showed there were ten spare trains, these numbers seem feasible. How many Class 755 trains will be able to link together? Could Lincoln be reached from London, via a reopened March to Spalding Line via Wisbech? Could a Yarmouth and Lowestoft service to London be created by reopening the chord at Reedham? Would it be a good idea to have a dozen First Class seats in the Class 755 trains doing the London commute. I feel that Greater Anglia have ambitious plans. From this rather crude analysis, it appears that Greater Anglia will be using the Class 755 trains as three and four car electric trains on the electrified lines to Cambridge, Ipswich and Norwich and then using their diesel power to create new direct routes to the capital. I also suspect, trains will split and join at Cambridge, Ipswich and Norwich to reduce the number of paths needed to and from London. After all one twelve-car train is cheaper to run than three four-car trains! Could Greater Anglia be bringing forward a timetable, where any town in East Anglia, with a population of over say 10,000, gets at least one fast train to London in the morning and back in the evening? As the tracks, signals and stations are already there, away from the main lines, there may be little that needs doing. If not, Greater Anglia have bought too many trains. In Basingstoke To Exeter By Electric Train, I started to work through, how short lengths of third-rail electrification could be used to power an electric train with an IPEMU-capability. This picture shows typical third-rail electrification at Kidbrooke station in South East London. Note the following about the station and the electrification. The two tracks are between two platforms connected by a footbridge, which is a typical layout for hundreds of stations. Some stations might use a subway for connection. The two 750 VDC conductor rails are placed together in the middle of the track, well away from the passengers. There is a gap in the third rail, which I assume is for staff or emergency services personnel to cross the track in an emergency. It is a simple and very safe layout. With many years of installing third-rail systems in stations, Network Rail has the expertise to create safe systems in stations with island or just a single platform. The Class 377 train is a typical modern electrical multiple unit common on third-rail routes. There are a total of 239 trainsets in service with lengths of three, four and five cars. The trains can work in combinations of two and three trainsets. The trains are a member of Bombardier’s Electrostar family. The slightly older Class 375 trains can be converted into Class 377 trains. The first trains entered service in 2003, so they still have many years of life. Some of the trains are dual-voltage and all could be equipped to use 25 kVAC overhead line equipment. They have a top speed of 90 mph. Bombardier have stated that these trains can be given an IPEMU-capability. In addition everything said about the Class 377, can also be said about the later Class 379 and Class 387 trains, although these trains are faster. The traction current supply to the trains has a very comprehensive design, that ensures trains get the electricity they need. Wikipedia says this. All units can receive power via third-rail pick-up which provides 750 V DC. There are eight pick-up shoes per unit (twice the number of previous generation 4-car Electric multiple units), and this enables them to ride smoothly over most third-rail gaps. The units in the 377/2, 377/5 and 377/7 sub-classes are dual-voltage, and are fitted with a pantograph to pick up 25 kV AC from overhead lines. On these units the shoe mechanism is air-operated so that when powered down, or working on AC overhead lines, they are raised out of the way. You don’t hear many reports of trains being gapped these days, when they are unable to pick-up electricity at somewhere like a level crossing. So there could be a large number of electrical multiple units available with an IPEMU capability, which could be ostensibly 25 kVAC units, but could also pick up electricity from a 750 VDC third-rail. I feel that Network Rail has the expertise to fit short lengths of third-rail electrification into stations, so that IPEMUs could pick up power, when they are stopped in the station. These pictures show the recent installation of third-rail in the bay Platform 3 at Oxted station. Note how the conductor rail is enclosed in a yellow shield. Could this installation at Oxted, have been done, so that IPEMUs can run a shuttle to Uckfield? Imagine such an installation at a station like Lowestoft, which has been suggested as a destination for trains with an IPEMU-capability. 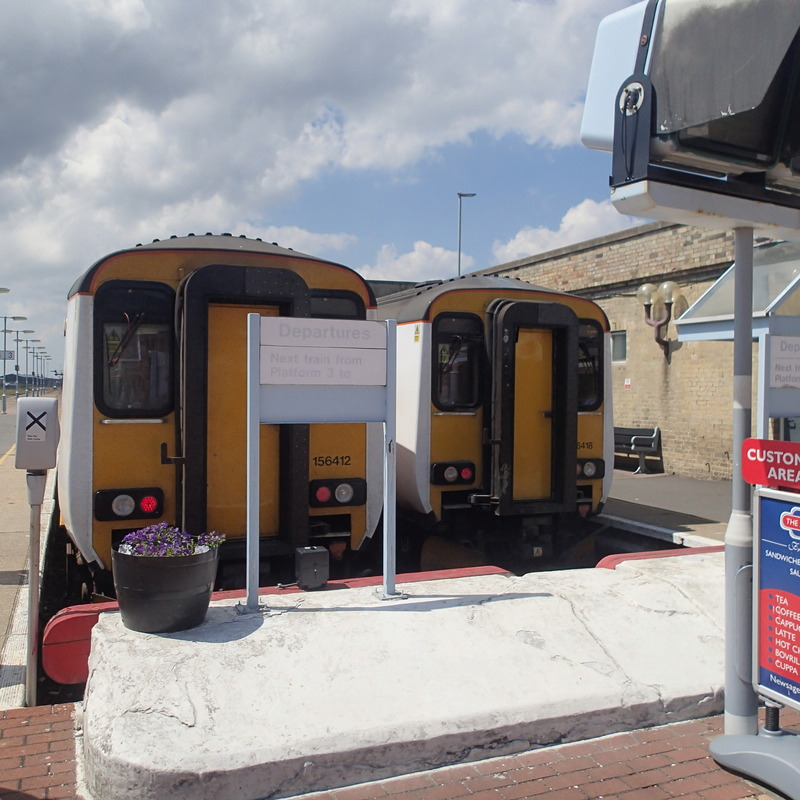 The picture shows two Class 156 trains at Lowestoft station. Surely, two lengths of 750 VDC third-rail can be fitted between the tracks. 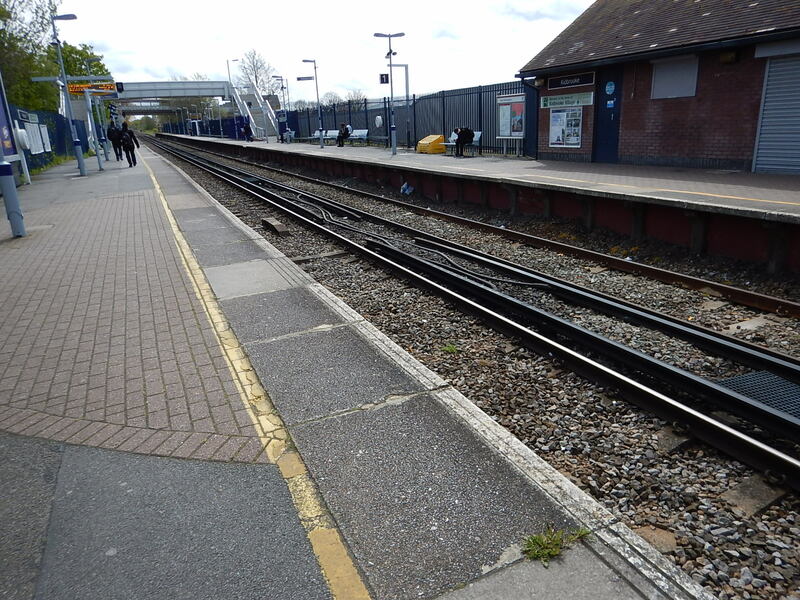 The electrified lines would be no closer to passengers, than the third-rail installation at Oxted. The power supply would only be needed to supply electricity to charge the batteries. When no train was in the platform, the electricity supply to that platform would be switched off. The waiting time in the station would need to be sufficient to make sure the battery had enough charge to get to the overhead wires at Ipswich or Norwich. There would be little or no modification to the structure of the station. There would be no electrification needed between Lowestoft and both Ipswich and Norwich. The biggest problem would be installing the power supply, but it would only be a transformer and rectiofier to provide 750 VDC. It would not have to cope with all the problems of regenerative braking, as the IPEMU capability of the train would take care of that. It would appear that by using trains with an IPEMU-capability and well-proven simple technology at Lowestoft, the town can be provided with direct electric train services to Ipswich, Norwich and London. At present the only trains with sufficient speed to not be a restriction on the Great Eastern Main Line, that can be given an IPEMU-capability are Class 379 and Class 387 trains. But Bombardier told Modern Railways, that a 125 mph Aventra is possible. It would appear that the infrastructure modifications could be very affordable too! The major cost would be the extra trains, but hopefully an increase in passenger numbers because of the better service would create the cash flow to lease them! Perhaps the biggest advantage of using IPEMU trains to Lowestoft, is that electrification of the tracks through a beautiful part of East Anglia will not need to be performed. It should also be said, that what works for Lowestoft, would also work for services to Sheringham and Great Yarmouth. The technique would also work for branch lines from an electrified main line, where the out and back distance was more than the range of an IPEMU running on batteries. Examples would include. But there are many more lines, where a charging station would bring much-needed electric trains to all over the UK. Some longer lines, where both ends are electrified and the distance is less than sixty miles, like Norwich to Cambridge and Carlisle to Newcastle, could be served by an IPEMU with sufficient range, that was charged at both ends of the line. So that leaves longer lines over sixty miles, with no electrification at either end or just one electrified end. Many, but not all, are through beautiful countryside and would the heritage lobby accept miles of overhead line gantries, marching through the hills and valleys. I believe that on some longer lines, by using short lengths of third-rail electrification in selected stations, services could be run by electric trains with an IPEMU-capability. Imagine an electric train an IPEMU-capability, approaching a station on a typical fast line with perhaps a 90 mph speed limit, like say the West of England Main Line, which is not electrified past Basingstoke. As the IPEMU applies its brakes, all of the energy generated by the regenerative braking would be stored in the train’s on-board energy storage, ready to be used to accelerate the train back up to line speed after the station. When the train makes contact with the third rail in the station, if the battery is not full, it can start to charge the battery from the rail. Once the battery is full, the charging would stop. On starting away from the station, the train could use power from the third rail, until it lost contact, after which it would use the energy stored on the train. I think it should be possible that the train would leave the station with a full battery. I would suspect that Bombardier and Network Rail are doing all sorts of calculations to find the best strategy, so that IPEMUs can be used to avoid the problems and costs of electrification. Lines that could be electrified in this way would be ones, where trains stop at several stations along the route. Electricity supply at the stations, is no problem these days, as it could be connected to the mains or to some form of local generation. It could be a very green concept! Lines that could be electrified in this way would include. Selected stations would be fitted with charging and the trains would stop accordingly. I’ve included the Far North Line because I believe it is possible to electrify the line in this way provided you could get a good enough electricity supply to the required number of stations. Obviously, you may decide not to do it, as you may have enough quality diesel trains. If you could run electric trains on the Far North Line using charging at stations, you could run electric trains on any line in the UK.